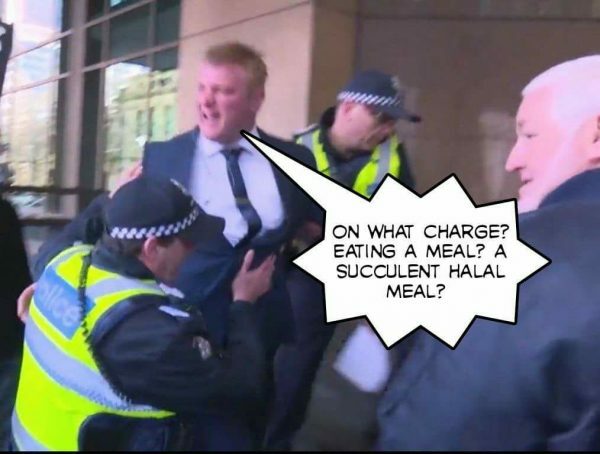 Yesterday, The Three Stooges (AKA ‘The Bendigo Three’) — Blair Cottrell, Neil Erikson and Chris Shortis — were convicted of serious religious vilification in Melbourne Magistrates Court over a publicity stunt the boys performed in October 2015, and fined $2,000 each. The trio has indicated that they intend to appeal the decision in the County Court. See : Far-right nationalists found guilty of inciting serious contempt for Muslims after mock beheading video, James Oaten, ABC, September 5, 2017 | United Patriots Front trio found guilty of inciting contempt of Muslims, SBS (AAP), September 5, 2017 | Far-right trio convicted, fined $2000 each, over mock-beheading mosque protest, Adam Cooper, The Age, September 5, 2017. As for Erikson, having already been convicted in February 2014 of stalking a local Melbourne rabbi — ‘Magistrate Donna Bakos said she had no doubt Erikson’s calls were motivated by prejudice and found he had little remorse for his crime’ — celebrated being given another slap on the wrist by the courts by disrupting a meeting of Yarra Council in order to harass councillor Steve Jolly. (See : Far right protesters storm Yarra City Council meeting over Australia Day ban, Melissa Cunningham, The Age, September 5, 2017 | Yarra Council meeting interrupted by far-right group protesting against Australia Day changes, ABC, September 6, 2017.) Among those who joined Erikson were George Jameson and Penny Louise/Tridgell of the Sydney-based Party for Freedom and locals Paul ‘Guru’ Franzi (sporting Soldiers of Odin merch) and UPF fanboy Luke Phipps. Note that the first public rally organised by the UPF took place in Richmond on May 31, 2015, and was called in order to demand Jolly be thrown out of office. See also : Fascists flail in Melbourne race hate trial, Corey Oakley, Red Flag, September 11, 2017. This entry was posted in Anti-fascism, Media, State / Politics and tagged Australia First Party, Bendigo, Blair Cottrell, Chris Shortis, Farma john, George Jameson, John Wilkinson, Linden Watson, Luke Phipps, Neil Erikson, Party for Freedom, Paul Franzi, Paul Guru Franzi, Penny Louise, Penny Tridgell, Soldiers Of Odin, Stephen Jolly, Stop the Mosque in Bendigo, United Patriots Front, Yarra City Council, Yarra Council. Bookmark the permalink. Gee, and I thought the three were just giving instruction in the Koran by acting it out. The magistrate clearly has no knowledge of Islam or she would have supported their kind assistance in helping people understand this particular middle eastern death cult, and in such an accessible and amusing way, too…although not as well produced as the ISIS educational videos for children we’ve seen lately: now they are really doing what the great M extolled. It should be noted that Anarchists have not been asking the State to penalise Fascists for their various appalling acts. This is because we don’t recognise the State as having authority to decide what is and is not appropriate speech. Any action they take against Fascists on the grounds of suppposed “extremism” is going to be aimed at the Left with far greater force at a later date. Instead, we seek to mobilise the working class and the communities targeted by Fascists to resist Fascism and take effective measures in self defence. The Three Stooges have a lot more to fear from anti-Fascist organising than from the State – and they know it.